Thanks to The Favourite we are being swept away by a feverish love of all things 18th century. England’s Queen Anne and the exploits of her close friend Lady Sarah Churchill have got everyone talking. Director Yargos Lanthimos intended to stir up the past and Sandy Powell, costume designer for the film took his brief and ran with it. The result is a visual canvas that we think is as much about Material Culture flipping between past and present as the way it photographs on screen. Michael Dahl painted Queen Anne in 1705, 3 years into her 5 year reign. Opulent and colorful her gown in this portrait bears little resemblance to how she is portrayed in the film. Material Culture is about objects and their relevance and symbolism to the society they sit in. 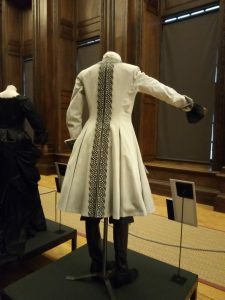 The House of Mirelle costume collection has it; we look at stitching, what it says about fashion of the era, the woman that wore them and through listening to what they say, also what it means to them. We noticed that Powell brought a bit of Material Culture into the film, imbuing clothes with a language all of their own. 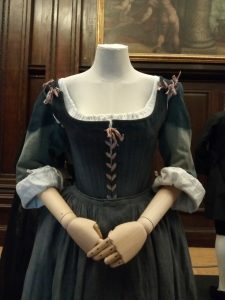 The result is a masterpiece of costume design. Anne reigned over England, Scotland and Ireland between 1702 and 1707. She is a significant not only because she was England’s second female monarch but because without her the United Kingdom would not exist; she joined England, Ireland, Scotland and Wales. Her reign was formally recorded but also informally in the memoirs of Sarah, her friend. There were letters sent between them which, if the film is to be believed, were collateral in a bitter falling out that resulted in the drama the cast rallied around – a stunning set of events. 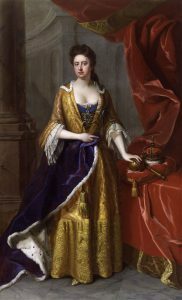 Jervas painted Sarah, Duchess of Marlborough after 1714. Departing from the film she was blonde, not the brunette depicted by actress Rachel Wiesz. Sarah’s letters initially coloured our view of Anne unfavourably but looked at afresh in the late 20th Century the lens of reinterpretation changed the view of Queen Anne and her reign. 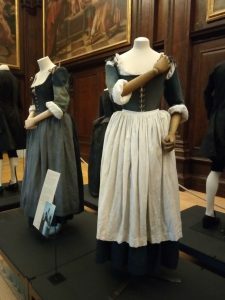 A modern eye changed historical interpretation and we think it’s the same with the film’s costume design. It is a very 21st Century tale with threats of communication like social media trolling, to bring about ruin. The Queen’s first favourite, Lady Sarah Churchill, is a woman who wants more than can be given in her time. Interpersonal brutality is not the romantic nostalgia associated with paintings like Jervas and Dahl’s and the culture of opulence depicted in silk, velvet and satin. Black and White Palette in the Favourite film. 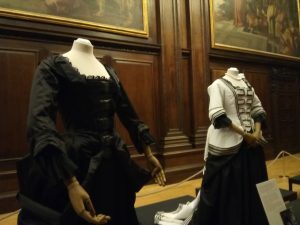 In the exhibition Powell explains her thoughts behind the film’s costume design. Historians might baulk – denim is used, a faraway glimmer from 18th century fabric design. But this choice brings to the audience a modern twist, a different association to the characters and what the costumes are saying in the film. The textiles used and the way they were created are like time travel on screen. We watch the action and denim, candlewick and lazer-cut trimmings trigger thoughts about the present whilst traditional costumes make us think about scheming and manipulating for power denied her in the past. Denim is a functional, basic fabric invented in America in 1873. Queen Anne presided over Franco-Indian wars in America’s 13 colonies, her successor, third Hanoverian monarch George III accepting the declaration of Independence in 1776. Powell said that she used denim to signify lowly birth. These were upcycled jeans bought from charity shops in Slough, Berkshire. Upcycled denim bought from British charity shops gives the kitchen scenes a functionality like the rail track workers who first wore jeans. In the kitchen denim unites men and women equally much the same as it does in modern times. Denim as a modern device. With the benefit of hindsight we look at the choice and think of what was to follow; without Queen Anne’s inability to produce an heir there would have been no George III, decisions about America and the Hanoverian line. Men as Peacocks in the Favourite film. Black and white was used as a palette but there was also blue and red. Political, blue signified Liberal Whigs and Tories in red – the way it is in America – a very different signifier than British politics today. Director Lanthimos wanted men to be peacocks. 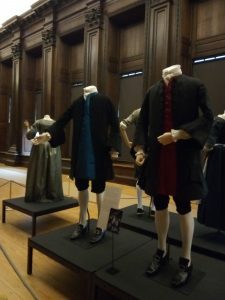 It was not difficult to imagine, breeches, jackets and wigs seen in the film a faithful reproduction of male fashion at the time. However it’s in the Prime Minister’s shoes we particularly enjoyed her choice. Tory red heels borrowing from Christian Louboutin’s. 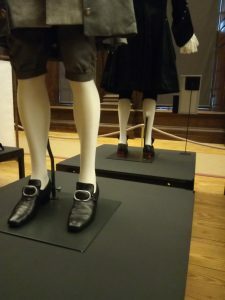 Other footwear in the film whether worn by scullery maids or Sarah Churchill were usually in functional black leather. Yellow is introduced under her black courtly gown but there is one pair of soles and heels that have colour; Tory red on the back of the Prime Minister’s – more time travel – reminding us of the modern-day pinnacle of shoe-fashion Christian Louboutin’s. The rear view was historically accurate: as important as the front. But it’s in Queen Anne’s candlewick coat that we saw the most association to Material Culture. 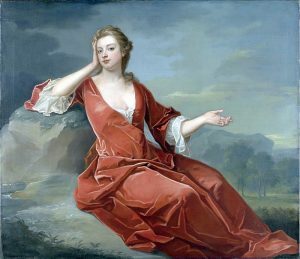 Powell talks about Queen Anne being depressed and ill, a woman with considerable losses who spends much of her time wandering around apartments as if she is ready for bed. Her grimy outfit looks like bedclothes. An old fashioned candlewick bedspread is added to give it interest on screen. Like denim Candlewick has a down-to-earth association – in the 20th century they were fashionable and found on beds across the nation. Queen Anne looking like her unmade bed. Candlewick under the film’s black and white palette. It is not a regal fabric nor one that would be expected to be found in the royal chamber. 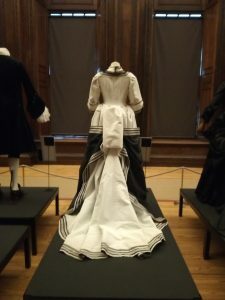 At Hampton Court Palace where she lives beds are soft and inviting, surrounded in curtains, carved from oak and draped in the most expensive of fabrics: taffeta’s, shot silks and satins. Walls are hung with tapestries intricately woven making us think about the Abraham Tapestries sewn with real gold, one of the most valuable historic artifacts in the United Kingdom Queen Anne assured survived. During WW2 Make do and Mend and clothes rationing meant women had to be inventive. Picture Post 1941. It causes us to think about modern, everyday women, women who do not have to accede to men in order to survive. 240 years after Anne’s reign ended Great Britain faced World War II. Women’s lives had moved on apace but it was still a society run mainly by men. The Duchess of Marlborough’s descendant was running the country. She may have had to rely on the reach of feminine influence but she achieved status through her children, grand children and great-great grandchildren – it was Winston Churchill’s war. 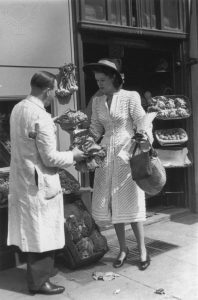 Facing the nation his coalition cabinet made decisions about commodities like fabrics which influenced fashion, announcing the imposition of clothes rationing in June 1941. Women had to Make do and Mend. Scraps of fabric were used for everything from trimmings to hats, collars and cuffs and belts. 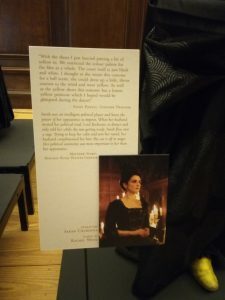 One woman took a bedspread much like that used in the Favourite and spread it across her table with pieces of paper in shapes fitting her frame. She needed a new coat but couldn’t afford using coupons left after buying essential items so she sacrificed her bed. Sarah Churchills coat, blotted with Tory red, the price of ambition. Another edge to edge coat filigree work cut with lazers echoing stained glass and the candlewick border from 1941. The result was captured in this photo above. She made it into a stylish coat with a border running around each of the hems. It suited edge to edge necklines fashionable at the time. Women gained much during WW II. Conscripted to carry out roles that the armed forces left behind it gave economic freedom as well as equality – it proved once and for all that there were no jobs that could only be done by men. Sarah Churchill used all her wiles and influence in the film, wanting autonomy and authority but at the end of her life it remained a world run by men. 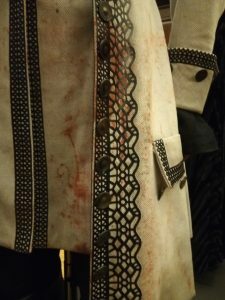 Her coat signifies what she went through in order to achieve what she wanted, Tory red and blood red spattering a costume made to look like a man’s. Hers was a world where women could not hope for political autonomy; it took her descendant’s war to re-set the nation. 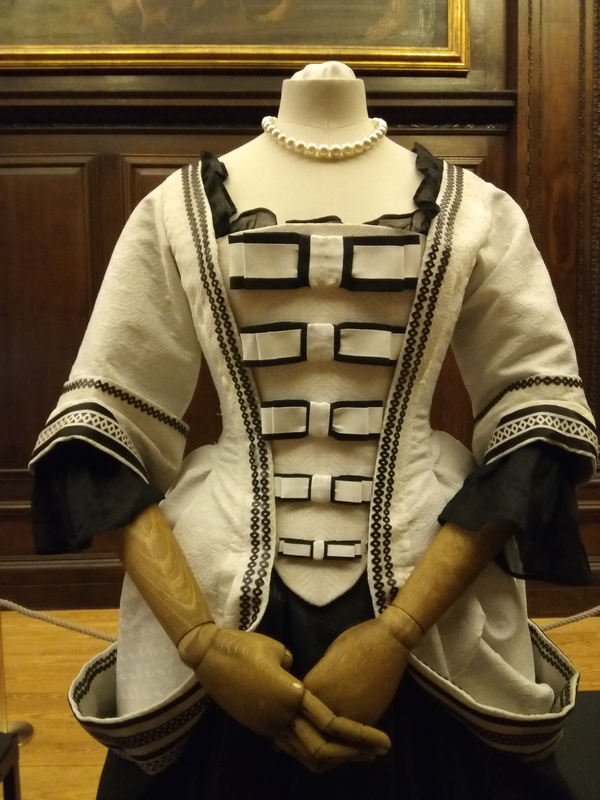 Sarah Duchess of Marlborough’s shooting outfit, equal to a man. Winston Churchill’s legacy was a society where women could run businesses, own property, choose who they married and not rely on their husband’s income, the influence of name or the Queen’s favour to get ahead. 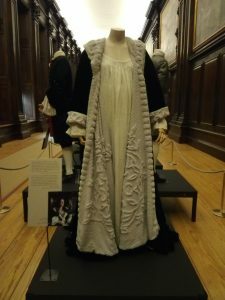 Queen Anne has been depicted as a woman ravaged by circumstance but it is through the visual language and Material Culture of historic drama the Favourite that we compare now and then. It a type of time travel between the society she desperately longed for and Queen Anne’s time. Sarah Churchill’s yellow shoes, the Favourite. She had a yellow petticoat also. We are reminded of the phrase Canary in the Coalmine, a warning of danger to come another industrial, down to earth element in the film’s costume design.